1. Lizards are found everywhere on earth except the Arctic and the Antarctic. 2. The largest lizard family is the skinks. There are nearly 1400 species worldwide. 3. Lizards make up the largest living group of reptiles, numbering about 3,000 worldwide. They are more predominant in warmer, drier areas. 4. Lizards for the most part are diurnal. They live in trees, on the ground and in burrows beneath the ground. They breed in the spring and most lay eggs following internal fertilization. 5. Lizards possess the sensations of smell and taste much as we know them. 6. Many lizards are also able to use the tongue and Jacobson’s organ to sample the air around them. 7. Northern fence lizard with mouth agape, they boldly inflate the chest and throat to present a menacing pose to anything that threatens. 8. Some lizards have no legs and might be mistaken for snakes. But you can always tell a lizard because they have eyelids and ear openings and snakes don’t. 9. Like other reptiles, lizards lay eggs, have scales and a tough outer skin and are ectothermic or 'cold-blooded'. 10. While many species lay their eggs and abandon them, skinks and glass lizards stay with the eggs until they hatch, guarding them from predators. 11. The upper and lower eyelids of chameleons are joined, leaving just a small hole for them to see through. They can move their eyes independently however, allowing them to look in two different directions at the same time. 12. Chameleons have long tongues which they rapidly extend from their mouth, too fast for human eyes to see properly. 13. Chameleons generally eat insects. 14. Some chameleons have the ability to change color. This helps them communicate with each other and can also be used for camouflage. 15. Geckos have no eyelids. 16. Geckos have unique toes which allow them to be good climbers. 17. Iguanas have a row of spines which run down their back and tail. 18. Green iguanas are popular pets. 19. The Komodo dragon is the largest type of lizard, growing up to 3 metes. 20. The largest lizard is the Komodo monitor. It can grow longer than a person. The smallest lizard is a tiny gecko. 21. Most lizards have dry, scaly skin. They have four legs, clawed feet, and a long tail. You can see their outside ear opening. 22. Lizards have a weak tail. A small bump or tug will break it off. This will puzzle the enemy. The lizard can get away. Not all lizards have weak tails. Lizard tails help in balance and movement. Fat is stored in the tail. Losing the tail can be a big problem. Some lizards can grow a new tail. The new grown tail is smaller and has no bones. 23. Some lizards eat bugs and spiders. Others eat plants, small animals, or even other lizards. Most lizards use their eyes to look for food. Some use their sense of smell. Lizards have jaws with teeth. They also have teeth on the roof of their mouth. 24. Few lizards are dangerous. But, be careful of lizards. Many lizards bite or have sharp spines. 25. Human are a problem for lizards. Some people eat lizards or lizard eggs. In the past, people killed lizards and sold their skin. 26. The lizard's habitat is sometimes destroyed by people building towns or farms. Few lizards are dangerous. But, be careful of lizards. Many lizards bite or have sharp spines. 27. Humans are a problem for lizards. Some people eat lizards or lizard eggs. In the past, people killed lizards and sold their skin. 28. Lizards smell with their tongue-like snakes. 29. Lizards shed their skin. 30. Some lizards, in order to protect themselves, can squirt blood 2-4 feet out of their eyes. 31. Some lizards can live over 30 years-the record, 33 years and 11 months, is held by aMexican beaded lizard. 32. The Perentie is a monitor (also known as a goanna) and Australia has about 25 of the world’s known 56 species of monitors. As a monitor, it is related to the much larger Komodo Dragon. Recent research suggests that monitors have the evolutionary remains of a venom gland, which may explain why wounds from the bites of these animals take a long time to heal. 33. The frilled lizard is part of the dragon family. 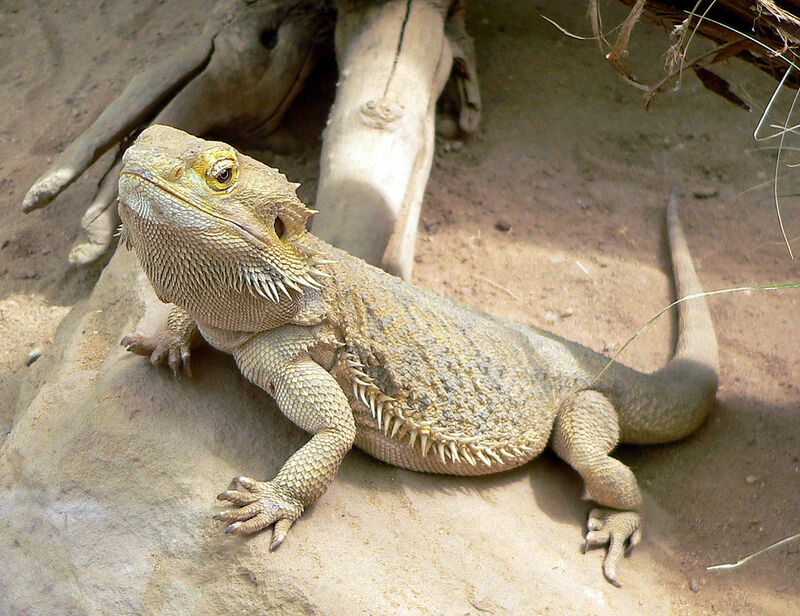 The Australians call the frilled lizard the "dragon lizard". 34. The frilled lizard is the reptile emblem of Australia and was depicted on the two-cent coin. 35. The frill cannot be erected unless the jaws are opened wide. The two actions are synchronous. 36. Frilled lizards in captivity seldom display their frill.